Discussion in 'Traditional Folders and Fixed Blades' started by Blwn99x, Aug 8, 2018. New member here. I'm looking for a fixed blade knife for camping/backpacking and another for edc. Budget under $100 if possible. 4"+/- blade and stainless. I formerly carried a Protech Godfather auto in 154cm for many years. I unfortunately sold the knife a couple years ago. However I put that knife through the ringer and was very pleased. What do you use? Any input is appreciated. Get a Mora knife. They are inexpensive, but tough. They keep an edge well enough and are easy to sharpen. They have a small variety of models in the range you are looking for, too. abbydaddy, afishhunter, WinchesteRalox and 2 others like this. I like the Ontario Blackbird. What he said. the best bang for your buck for camping is probably the Kansbol, on the left, about thirty bucks. If you hadn’t specified stainless, I might have suggested the Varusteleka Jakkaaripuukko, on the right. You could have them both for $100.00. For EDC, why not a Buck 102, 105 or 119. With the Mora well within your budget. Fodderwing, JTB_5 and WinchesteRalox like this. My favorite woods blade is a Loveless style drop point hunter. I find that much more useful than most clip points. Tanto style blades are fairly useless for most outdoor tasks. That being said, you can find that type of knife in multiple versions. Beretta and Gerber both ran off large numbers back in the 1990's (when Bob was alive), and they can still be had for comparatively little money. The plastic handles ones are flat out cheap, but the burl handled ones look better and feel better in hand. The blades on those were stainless, and some were manufactured in Italy, some in Japan. There are a number of traditional blades out there that would fit your requirements, especially if you're not hung up on buying something brand new. I've picked up a nice Marbles, and a good Case fixed blades in the past month for less than your proposed price point. I'd suggest you look through the thread (on this forum) about fixed blades and see what looks good to you. In my experience traditional styles work best, because they were designed by people who used them much more intensively, every day, than most current generations can or ever will. And it's darn hard to wear out a knife if it's used properly. Mora or Cold Steel Pendelton Lite for a tough, inexpensive knife that will get the job done, and are easy to keep sharp. 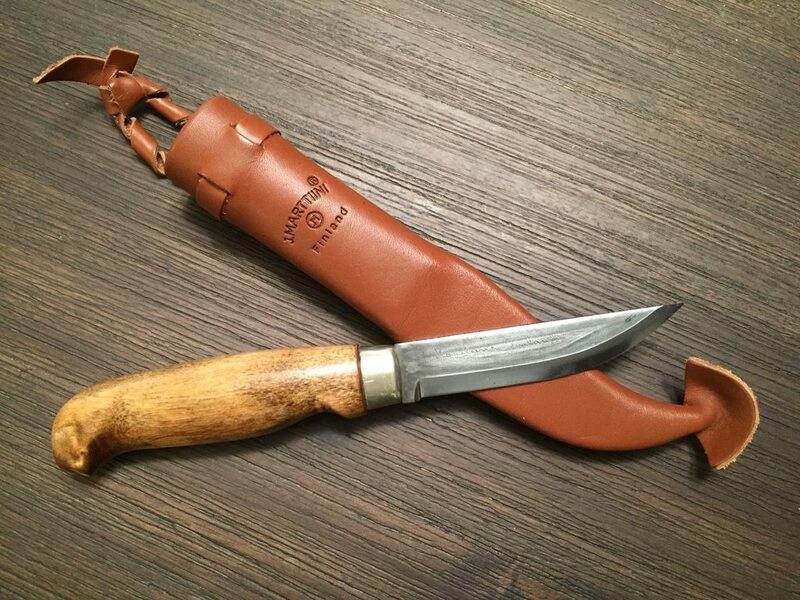 The Mora/Puuko has been used successfully in the woods for bushcraft for well over 140 years. Thank you for all the replies. I will do some more research. Welcome to the forum @Blwn99x! We’re glad to have you here. I’ll echo what others have said about Mora. I haven’t tried their outdoor knives, but their model 106 and 120 sloyd knives are a fantastic value and have great blades that are easy to sharpen and hold their edge well. This one is carbon, with a 10 cm blade, but they also offer a stainless model with a 11 cm blade. Note, though, that I refinished the handle on mine. They come from the factory with a rougher finish. Henry Beige, Mongo and Fodderwing like this. I'd suggest a Case fixed blade if you want new, or a vintage Western in carbon steel. For camping I like the smaller bird and trout style, like the Case Finn or the Western small Boy Scout pattern. These can all be had for <$75. These have leather stacked handles. I like my traditional fixed blade knife's handle and sheath to be made with natural materials, there are plenty to be found. I really like bird and trout designs for EDC but I also like a lot of sliciness in my EDC as I refuse to use them as prybars or the like. I'm harder on my "woods" knives where a little more side loading is used to get wood chips loose or simply to have something more reliable. For something that fits both there are a few bird and trout/EDC kind of models that work for a little bit of everything. LT Wright has the coyote which is fantastic, I have a Crawford bird and trout in AEB-L stainless which is similar in blade design but a very different handle. Crawford is a form knife maker and he had one of these listed in the knifemaker's market a few weeks ago. LT Wright has a lot of really cool items for EDC and outdoor use in that size and I think around the blade length though I think most of them in the $100 price range are in the 3" size, which I prefer for EDC generally. I've used a mora classic and companion, decent but I don't care for scandi grind outside of the woods use setting but it will still slice. CRKT mossback is a nice budget option but it's only in SK5 carbon steel but it's coated so not too bad. I've tried a handful of different options from the forum knifemakers and have been happy with many of them even though I didn't use them as much as I should have. BladeHQ's website has a really good filter system that makes it easier to see a lot of different options within your set parameters. Mr. Tettnanger and Old Hunter like this. Misplaced Hillbilly, Hickory n steel, Mr. Tettnanger and 2 others like this. Hmmm, camping blade is gonna get you tons of options.... just what are you gonna use it for? Wood processing? Cooking? Many many options. EDC... again, many options there... I favor a small fixed blade, and my majority go to is one of my two BRKT Mini Canadians. A fabulous "little big knife", or is it "big little knife"? So many choices...my camping blade is the one I will carry when in the woods for all tasks. I do have a hatchet and small saw for “lumber” work. A Mora or other puukko would pair nicely with hatchet and saw, I frequently carry this combo and there's not much one can't do with it. I quite like the stainless Mora uses and find it comparable to their carbon for edge holding and ease of sharpening. I'm thinking the Buck 119 would be a great choice. I have both GEC. and Buck knives. When it comes to fixed blades there's no comparison in my opinion. Buck is far superior. Another vote here for Buck, particularly the 119. They are well made but not too expensive and easy to find. Buck’s standard stainless steel is 420HC, and it holds a decent edge yet is easy to sharpen. It also is very corrosion resistant. Grohmann #1 Trout/Bird. From squirrels to deer, 4" long blade. Rosewood handle. They sell a leather sheath with it. Factory seconds are half price. Look up "wooded beardsman catch and cook" on youtube. The guy has $2000 worth of Grohmanns yet swears by the trout/bird for everything.